He didn’t give up, He worked very hard for his new born daughter, He used to to take his little angel to work because there is no-one available to look after her after his wife died shortly after giving birth. 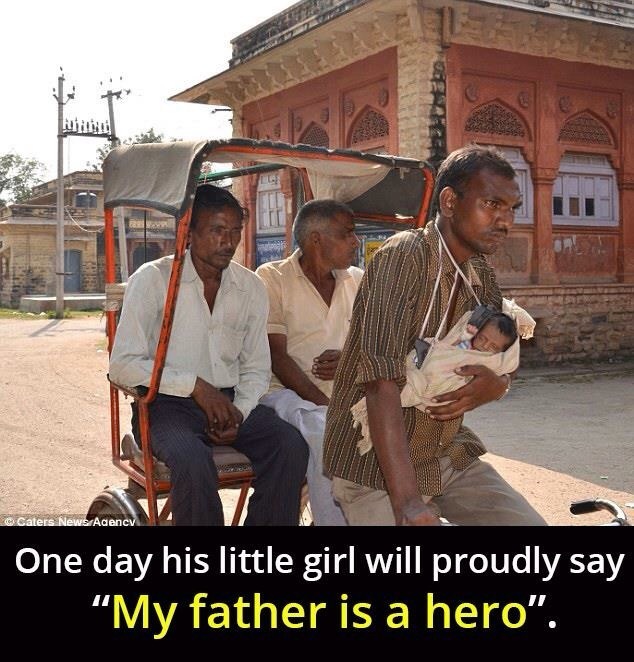 The day will come, when his little angel will proudly say “My Father Is A Hero”. Indeed he is. Bablu Jatav has been carrying his one-month-old daugher, Damini, in a cloth sling around his neck since his wife Shanti died shortly after giving birth to her. The devoted dad, 38, said he was now forced to take the baby to work with him in Bharatpur city everyday because he has no other relatives to care for her. In another cruel twist baby Damini was rushed to hospital in Jaipur city earlier this week after she became critically ill .
‘Since then there has been no-one to look after my daughter, I keep her with me even when I pull my rickshaw.’ He says. She was in intensive care after being admitted with septicaemia, anemia and severe dehydration. Luckily the newborn baby girl is now on the mend and said to be in a stable condition. Mr Jatav has been overwhelmed by offers of help after his story emerged and it is believed the Indian authorities are now stepping in to help Mr Jatav after hearing of his plight.